We love our shirting. Our aim is to provide you with a wardrobe of "favourites" that will fit every occasion. Everyone knows Golden Boy, right? Like your favourite T-shirt you wore to death in your childhood, we want to provide you with an army of superheroes so you can meet every deadline, make every sale and be that winner. Similar to our suits, one of the key differences to our custom shirts is the set of body intricacies we account for when creating your "model pattern”. This drives the cutting of your shirt, and allows for the ability to adjust for things like a sloping or forward shoulder. This is paramount to getting a proper custom tailored shirt , offering a cleaner fit and is not something all custom clothing shops can do. Our craftsmen touch every shirt and put on every button by hand. We do this with the old-school method of button attachments, using the distinctive three-point "chicken-foot stitch" in the tradition of Neapolitan shirt-making. It takes real skill to do this and it offers an elegant point of difference to shirts with regular X cross-stitches -a wonderful point of difference..
Oh, and we only use Mother of Pearl buttons, which are noticeably thicker than regular buttons at a 3cm thickness (standard). These are like really thick pieces of sushi, made from the thicker part of the pearl shell – a sign of quality and respect for the shirt. While most shirts are made with dull plastic buttons that try to imitate MOPs, they can never replicate the wonderful natural lustre of pearls. A skilful eye will notice these details – to everyone else, you just look damn classy. Also standard on all of our shirts is a triangular embroidered gusset attached by hand at the base of the side seams. Most shirtmakers don't bother with this step, but it adds durability and flexibility when sitting and offers a better finish to help you wear your shirt year after year. The interlining used inside the collar and cuffs is very important as it affects the crispness of the collar and the feel of the shirt. You may have found that other shirts have a stiffness and thickness in their collars like a neck brace. Our tailored shirts are made with a soft interlining which provides the perfect blend of comfort and firmness, allowing the collar to stay tall and proud all day. You never have to worry about your collar collapsing beneath your jacket or fraying to the side like a nutty professor – you have enough to worry about! We also offer a traditional unfused method which is great for more casual shirts to wear on the weekend. Our shirts are made with a Split Yoke on the back of the shirt. This is another of those gold-standard measures for quality "bespoke" shirting. The Yoke refers to the panel of fabric connecting the neck and top shoulder area, which can be made either of one single piece of fabric (as in most cheaper shirts) or "split" into two. A Split Yoke is not only aesthetically more pleasing (especially with striped shirts like bengals), but it adds an element of further comfort and strength in the shirt. Shirting fabrics have higher tensile strength diagonally as opposed to horizontal and vertically, allowing for a bit of a stretch. This takes more time to construct, but it's just one of those things that gives you confidence, knowing that your shirts will sit comfortably and provide you with the movement necessary to get you through your busy day. Our shirts are made with a traditional split yoke, seen in the two diagonal panels joined in the middle as opposed to one solid piece. 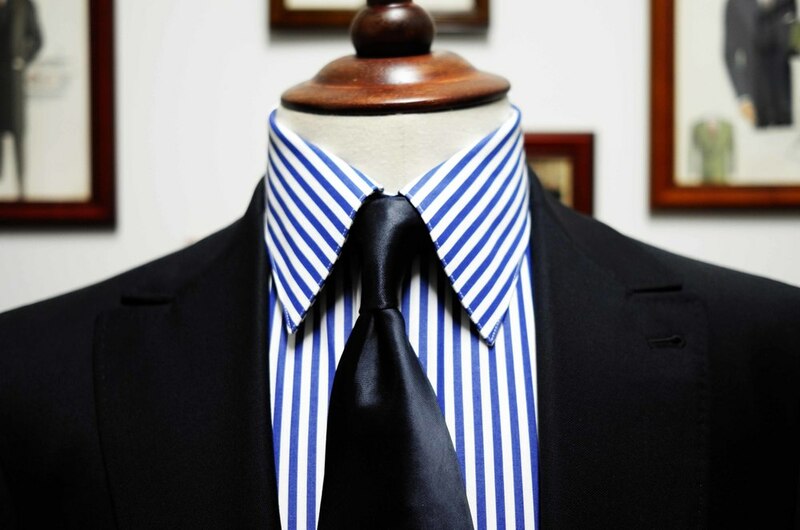 Gives stripes shirts a better finish and allows for more stretch in the shirt. Our shirting uses single-needle stitching on the sides of the shirts, evidence of quality workmanship that offers an elegant yet functional to join the front and back panels of the shirt. Single-needle stitching is identifiable by a single row of thread at the seams as opposed to two sets of stitches running parallel. It is infinitely neater as the twin-stitch method, used by most shirtmakers, causes bubbling to occur. Single-needle stitching is essential when it comes to formal and dress shirts, and this is why it’s a standard at Herman Bros & Co.
Our shirts are stitched with nineteen stitches per inch, a key quality measure that is right up there with some of the best shirts on the market. The more stitches per inch, the finer the stitching and the neater the shirt. While this comes at a cost and takes longer to construct, it is preferable to the process of most shirtmakers which uses far less dense stitching for a weaker and rougher unpolished finish. We also stitch on the edge of the collar and cuff for a more refined look, which again takes that extra bit of skill in the production process. Your shirts should be able to live with you throughout the years, since you've spent the time designing and getting to know them! Be a pal – there's no need to kill golden boy, so bring your shirts back after the cuffs and collars inevitably fray. We'll replace them for you for a nominal charge of $15 and your shirts will be good as new. It's just a part of how we do business – we are about building relationships, now and through the years. We also provide spare collar stays and buttons with each year in case you need spares. And our shirts come standard with removable gold-coloured stainless steel collar stays with our logo etched onto it. They are really magnificent, and you'll face every day knowing you have two best friends keeping your collar nice and high – don't worry, we’ve got you covered.